This was a really easy recipe to make and tasted great. Often when you're trying to find alternatives for recipes you have the memory of what you know something should taste like. So then get disappointed when the alternative doesn't quite match up. 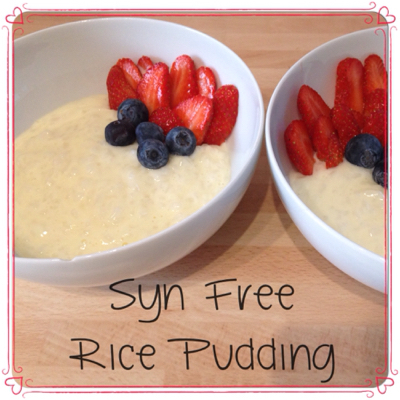 Growing up rice pudding was almost a staple part of our diet, particularly after a Sunday roast dinner. We were so well known for having rice pudding, someone once told my brother when he was a lot younger, if you don't behave you won't get your rice pudding. I think that threat might even work on him now 😉. Although this didn't taste exactly how rice pudding normally tastes it was still really yummy and I'll definitely be making it again. Put the cream soda and rice in a pan and bring to the boil. Then simmer until all the liquid has been absorbed (approx 20 - 25 mins). Take off the heat and leave to cool slightly, then stir in the yoghurt and extract (if required). Someone suggested using half vanilla yoghurt and half natural Greek yoghurt for a slightly less sweet version. This makes 2 portions. Serve with fruit of your choice.